Perhaps you currently have someone who is in conflict with your own interests, and you refer to him or her as your enemy. You may be surprised to learn the hidden meaning in the Chinese character 仇 (chou), meaning hatred, enmity, or enemy. On the left side is the radical 亻, which refers to man. When seeing this radical in a Chinese character, even illiterate people could guess that it relates to a human. On the right side is 九. This radical doubles as a full character meaning the number nine, but sometimes it refers to a general term for plentiful or numerous. Thus the meaning of the character 仇, enemy, is a person who helps uplift you to higher levels. People around us all have different moral standards, and we recognize a person with a higher moral level as a good person. During a conflict with an enemy, if a person handles the situation well, he or she can become a better person in the process. Both Eastern and Western cultures believe that if a good person keeps improving and uplifting himself, becoming a better and better person, he or she can go to heaven and become a heavenly being. 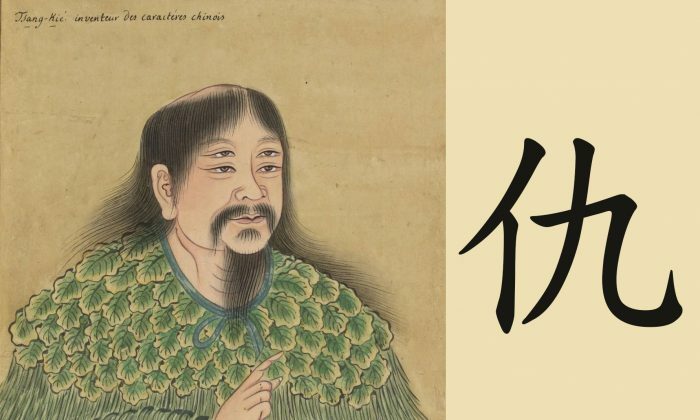 Legend has it that when Cangjie created Chinese writing 5,000 years ago, heavenly secrets were revealed. It was so moving that the deities and spirits cried, and their tears dropped like millet from the heavens. After learning the secret in this Chinese character, we can also understand why Jesus, living in the Middle East 2,000 years ago, told his disciples to love their enemies, though he did not explain the reason.